It’s official! 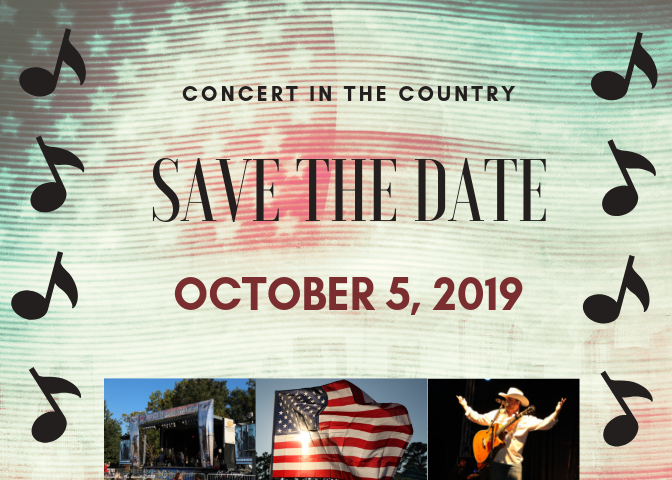 The 4th Annual Boots For Troops Concert in the Country will be going down October 5th, 2019! The Concert in the Country committee, Boots For Troops family and I would like to encourage everyone to save the date! Since the inaugural event in 2016 Boots For Troops Concert in the Country has raised $145,000 dollars for the organizations programs. Helping Boots For Troops send out more than 825 custom care packages to deployed troops. The event has also helped purchase 81 round trip flights for active duty service members to fly home to their hometowns and spend Christmas with their families. In 2017 the event made a $16,500 donation to Green Zone Housing, a Montgomery County nonprofit who helps homeless veterans. The event originated during a conversation I had with my father in-law Shane George one night back in early 2016 when Boots For Troops was just getting started and less than a year old. Him and I were discussing ideas for fundraisers. We wanted to do something special. An event that the community didn’t really have. We both share a love for music and thought what if we host a large concert event in the front pasture of his 35-acre farm. Boom! Concert in the Country was born. There was only one problem. Nobody had any experience putting on a concert event. I went right to work. Researching everything I could about putting on a concert. I spent hours and weeks learning. Calling and talking to people in the industry. I was in the dark but determined to figure it out. I didn’t want to put on just a small shin dig concert, I wanted it to be the whole shebang. I knew the importance of making a positive everlasting impact on the first-year attendees. That was the only way Concert in the Country was going to gain traction for the future. We assembled a team of 8-10 people and formed the first ever Concert in the Country committee. These amazing people immediately bought in to the plan. We have also had many local business step-up and sponsor the event. I learned early on that it would be impossible to have a successful event without the right amount of sponsor help. Thank you to all the amazing business that have committed to Concert in the Country. Originally, I think people thought they were coming to a small concert event. They quickly realized that it was the real thing. Concert in the Country is set on the top of a 13-acre horse pasture. Where you really get to experience a country feel. It also features a one of a kind VIP area where VIP and Sponsor guest receive first class treatment. Concert attendees are encouraged to bring lawn chairs and blankets and enjoy the beautiful property and scenery with the whole family. Other attractions include food trucks, kids’ activities and vendors. Over the past 3 years the event has featured some of the best in the Texas country music circuit. Entertainers such as The Josh Abbott Band, Josh Ward, Jason Cassidy, Jake Worthington, Mike Donnell and Jody Booth have taken the stage. Mark Wills, a multi-platinum selling country music star with eight top 10 hits headlined in 2017. In 2019, we are discussing changes. Possibly a longer event with more entertainers. Maybe adding a car show or cook-off. We want to hear any suggestions from our fans. How can we make the event better? The coolest part of this event is that 100% of the proceeds raised go back to Boots For Troops. There are no for-profit investors. The most frustrating part for me is getting the artist to understand the impact playing this event has on supporting our deployed troops. It’s HUGE! And the artist that have played Concert in the Country understand it. Many of them seek to play the event every year now. Every year I beg and plead with management to enlighten the newcomers on what Concert in the Country is about. Not for any monetary gain or discount, but so the artist understands and can help make the event as successful as it can be leading up to event day. Matter of fact last year Josh Abbott told me. “I wish I would have known what all was going on here, I would have showed up a lot earlier”. As a veteran myself who has been deployed and understand the impact of our programs, I like to tell the artist that this is one of the best things they will ever do in their career. Play at Boots For Troops Concert in the Country and give back to all the men and women serving abroad who give us the opportunity to live freely. I’m looking forward to our line-up release party later this year. In the meantime, mark your calendars for October 5th!